Most Rev. Antonio Buenafe, S.V.D., D.D. Most Rev. Federico O. Escaler, S.J., D.D. Most Rev. Generoso C. Camiña, P.M.E., D.D. Most Rev. Warlito Cajandig y Itcuas, D.D. Most Rev. Rolando Joven Tria Tirona, D.D. Most Rev. José Paala Salazar O.P., D.D. Most Rev. José Corazón Tumbagahan Tala-oc, D.D. Jaime Lachica Sin DD, PLH, OS, OL (Chinese: 辛海梅; 辛海棉 Xīn Hǎiméi; Xīn Hǎimián; Latin: Iacomus Sin; August 31, 1928 – June 21, 2005) was the 30th Roman Catholic Archbishop of Manila, and was also a Cardinal. Sin was born into a wealthy family in New Washington, Aklan, Philippines to Juan Sin (of Chinese ancestry) and Aklanon Máxima Lachica. He was the seventh of sixteen children. He eventually left his childhood home and his family to study in St. Vincent Ferrer Seminary, and was ordained a priest of the Archdiocese of Jaro on April 3, 1954. He was the first rector of St. Pius X Seminary in Lawaan Hills, Roxas City, Capiz, serving from 1957 to 1967. 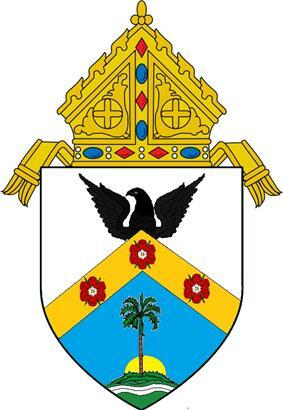 On February 29, 1960, he was named Domestic Prelate (present-day, honorary prelate with the title of Monsignor. He was appointed auxiliary bishop of Jaro on February 10, 1967, and was consecrated bishop of the titular see of Obba on March 18 of that year. On March 15, 1972, Sin was appointed Coadjutor Archbishop of Jaro, taking on administrative roles in the archdiocese, while holding the titular see of Massa Lubrense. On October 8, 1972, Sin was appointed Archbishop of Jaro, taking full supervision of the archdiocese. Sin's service as Archbishop of Jaro ended with his appointment on January 21, 1974 to the larger archdiocese seated in the national capital of Manila. Sin was initially reluctant to take on the role of leader of the Catholic Church in the Philippines. He was officially installed as Archbishop of Manila at Manila Cathedral on March 19, 1974, making him only the third native Filipino in the office after centuries of Spanish, American and Irish archbishops. On May 24, 1976, Pope Paul VI made him a member of the College of Cardinals, creating him Cardinal Priest of the titular church of Santa Maria ai Monti. He participated as a cardinal-elector in both the August and October papal conclaves which elected Popes John Paul I and John Paul II respectively. In the August conclave, he reportedly told Albino Luciani, "You will be the new pope". After Luciani was elected as John Paul I, Cardinal Sin paid him homage, and the new pope said: "You were a prophet, but my reign will be a short one". He remained the youngest member of the College until 1983. His title and surname as Cardinal Sin (another term for a deadly sin) were a point of humour in the Philippines and for Filipino Catholics. Examples included "The greatest sin of all: Cardinal Sin", and even his own pun of "Welcome to the house of Sin" that he used to greet guests at Villa San Miguel, the Archbishop's palace in Mandaluyong. As a predominantly Catholic country, issues in the Philippines have and are influenced by the Church in varying degrees. Condom usage has historically been a controversial topic. 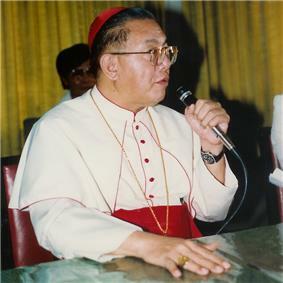 As the reigning Archbishop of Manila in 1996, when the government distributed condoms to curb HIV infection rates, Sin called the programme as "intrinsically evil", in line with Church teaching on the matter. Sin also denounced then-Health Secretary, Juan Flavier, with some asserting that the latter's condom-promotion had made him an unwitting agent of Satan. Prominent Catholics also protested against the government's condom-distribution programme by publicly burning boxes of condoms. Events in the Philippines under President Ferdinand Marcos forced Sin, the spiritual leader of Filipino Catholics, to become involved in politics. He became witness to corruption, fraud, and even murder by the regime and rising popular discontent with the dictatorial rule of Marcos and his wife, Imelda. Within six months of his appointment as Archbishop, Sin was criticising the authorities after the military raided a Manila seminary on the grounds that it was harbouring insurgents. Sin appealed to Filipinos of all religions to follow the teachings of Jesus in the Gospels and use peaceful means to change the political situation in the Philippines. Beginning in the 1970s, Cardinal Sin, a moderate, was among the leaders who publicly pressured President Marcos to end martial law, out of concern that leftist radicals would overthrow the government. Sin eventually decided to speak out in support of Corazon Aquino, the widow of the assassinated opposition leader Benigno Aquino, Jr., in calling for an end to martial law. This led to massive popular demonstrations, often led by nuns whom riot police dared not attack. In February 1986, he called on Filipinos to surround the police and military headquarters in Manila to protect then-military Vice Chief of Staff Fidel Ramos, who had broken with Mr. Marcos. More than 1 million people took to the streets praying the rosary and singing hymns in an outpouring that shielded anti-government rebels from attack. Some soldiers decided to join the marchers. In what later became known as the People Power Revolution, Marcos, his family, and close advisors were forced to flee the Philippines and took up residence in Honolulu, Hawaii upon the invitation of U.S. President Ronald Reagan. Cardinal Sin, along with presidents Corazon Aquino and Fidel Ramos, became known to Filipinos as the architects of the People Power Movement. Sin decided to intervene again, in 2001, to become spiritual leader of another People Power Movement. Some Filipinos alleged that president Joseph Estrada was guilty of widespread corruption and graft because of the controversial "second envelope". Poor people marching in the streets, with the support of Sin, the elite and military generals, succeeded in toppling Estrada from power and elevating Gloria Macapagal Arroyo as acting president in what was perceived by the international community as a triumphant democracy. The "second envelope" was opened after the coup and turned out to be Estrada's bank account. Commenting on the endemic corruption that persisted after Marcos, Sin said, "We got rid of Ali Baba, but the 40 thieves remained." It was reported that the cardinal's actions caused uneasiness at the Vatican and that he was summoned to Rome to explain himself. Hours before hundreds of soldiers and officers staged a failed revolt against President Gloria Macapagal Arroyo in July 2003, he urged Filipinos to be vigilant against groups plotting to violently overturn the country's democratic institutions. Two and a half years after Sin's death, it was reported that at the height of EDSA II, Sin received a directive from the Vatican ordering him and the Philippine clergy to adopt a non-partisan stance towards the political crisis. Sin, who by then had committed support for the EDSA II revolt, was said to have threatened to resign as archbishop if compelled to withdraw his support. The standoff was reportedly resolved with the mediation of the then Supreme Court Associate Justice Artemio Panganiban (later, Chief Justice of the Philippines), a member of the Pontifical Council for the Laity, a department of the Roman Curia. As a result, the Vatican did not insist upon its earlier demand. The reports were attributed to persons reputed to have first-hand knowledge of the events, but there has been no official confirmation of them from the Vatican or from the Archdiocese of Manila. He retired as the Archbishop of Manila on September 15, 2003 and was succeeded by Gaudencio Borbon Rosales. He was too ill to travel to the 2005 conclave that elected Pope Benedict XVI. Afflicted for years with a kidney ailment brought on by diabetes, he was taken on June 19, 2005 to the Cardinal Rufino Santos Medical Center in San Juan, Metro Manila because of a slight but lingering fever. 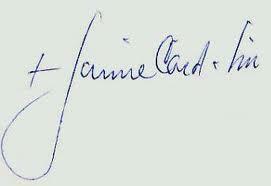 He died of renal failure on June 21, 2005 at the age of 76. The government accorded him the honour of a state funeral and a period of national mourning through Presidential Proclamation № 863, s. 2005 signed by President Gloria Macapagal-Arroyo. He was buried beside his three immediate predecessors in the crypt of Manila Cathedral, after a funeral there attended by thousands of Filipinos. Most Rev. Juan Velasco, O.P., D.D. Sin was decorated three times by the Philippine government. The first time was by president Corazon C. Aquino, who conferred him with the Philippine Legion of Honor, rank of Chief Commander; the second, by president Joseph Estrada, who conferred on him the Order of Sikatuna, rank of Rajah; the final time was shortly after his retirement, when President Gloria Macapagal-Arroyo conferred on him the Order of Lakandula, rank of Bayani (Grand Cross). 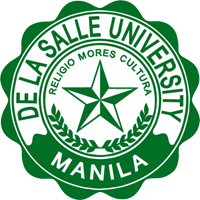 Sin also received 26 honorary doctorates in various fields from higher education institutions in the Philippines and abroad (mostly from notable universities in the United States of America), among which are the Brandeis University and Boston College. ^ a b "Modern Heroes of the Church - Leo Knowles". Google Books. Retrieved February 15, 2014. ^ Engel, Jonathan (2006). The epidemic : a global history of AIDS. New York: Smithsonian Books/Collins. p. 262. ^ a b Shenon, Philip (January 21, 1996). "DEADLY TURNING POINT: A special report. ;AIDS Epidemic, Late to Arrive, Now Explodes in Populous Asia – Page 7 – New York Times". ^ McIntosh, Alistair (January 4, 1995). "Philippines: Manila Health Minister an Unlikely Agent of Satan". Reuters NewMedia. Retrieved November 2, 2011. ^ a b c d Labog-Javellana, Juliet (January 21, 2008). "Sin opposed Vatican order, pushed Edsa II". O'Donnell, Michelle (June 21, 2005). "Cardinal Jaime Sin, a Champion of the Poor in the Philippines, Is Dead at 76". "Philippine Cardinal Jaime L. Sin Dies at 76". Washington Post Retrieved 2011-09-18.